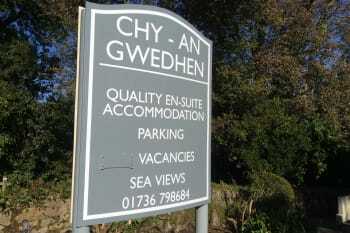 Chy an gwedhen is a friendly family run bed/breakfast owned by Pete and Heidi Wakenshaw. The guest house is situated one mile from the beautiful town of St. Ives, adjacent to the coastal path leading to both st Ives and Carbis Bay. Local buses run regularly into town. There is a local pub a few mins walk away that serves evening meals. 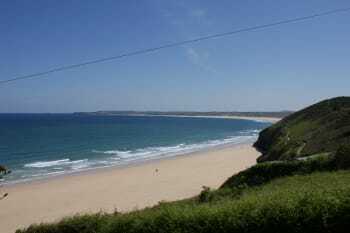 West Cornwall golf course is 5 mins away with beautiful views across Hayle beach. We have 5 rooms, all with en-suite and all have flat screen T.Vs, hairdryers, tea/coffee trays, 3 of our rooms have lovely sea views. Private parking and Wi-Fi are free. We can promise you a warm and friendly welcome. There are no rooms available at Chy an Gwedhen for these dates. Very welcoming hosts in a lovely B&B with an excellent breakfast. We liked the location which allowed us sea views from the room and the opportunity to walk into St Ives without having to take the car. A very pleasant stay - thank you. We loved the Hepworth Studio museum and The Tate. We went to the Newlyn Filmhouse one night which was a very nice independent cinema about 20 minutes drive away. A trip to the Lizard and a walk along the dramatic coast line to Kynance Cove was a lovely experience. We had a fabulous stay. Pete & Heidi were really friendly and helpful. They made us feel very welcome. I would definitely recommend Chy An Gwedhan to other travellers. Ideally located for the South West of Cornwall. Lots to see and do. Good restaurants in St Ives & Carbis Bay. Heidi and Pete were exteamly helpful with any request. This included providing a socket for charging my plug in hybrid car. Breakfast and the availability of other food and drink were excellent. I would recommend this guesthouse to anyone. Fantastic room views. Peter and Heidi and so friendly and very accommodating they both made our stay such a nice one. The accommodation was very clean and comfy. About 10-15 minute walk to St Ives centre or a few minutes taxi ride if you are not too good at walking. Highly recommend a stay at Chy an Gwedhen if looking for a very reasonablely priced accommodation close to St Ives Centre. There are so many fantastic cafes, bars and restaurants to visit to eat and drink. Take you time to look around as you’ll discover something new on every visit. Our stay was excellant, Pete and Heidi couldnt do enough,very helpful with walks, and places to have a evening meal, bus stops,St Ives, Penzance etc ,every where so clean, room was excellent, large shower, bed really comfortable,lovely to have tbere carpark rd the back 10 out od 10. Bus stop outside, train station St Ives, local fish and chip shop, and local pub that serves good meals. Car park is located at the rear of the property down a lane which is unsignposted but not the lane a sat nav sends you down. Absolutely excellent B&B and lovely, friendly, helpful owners Pete & Heidi. Great location and parking a bonus. Room spotless and very comfortable. Great choice of breakfast. Heidi and Peter so friendly and helpful. Take the train from St Erth to St Ives for a beautiful trip along the coast and avoid the nightmare of parking and driving in St Ives. A visit to the Minack theatre is a must do. COMFORTABLE ROOM, GOOD BREAKFAST, EXCELLENT HOSTS, GOOD LOCATION. GOOD FOOD AT PUB ACROSS THE ROAD. SOME EXCELLENT AND NOT TOO TAXING WALKS DIRECTLY FROM THE PROPERTY. Welcoming, helpful and informative hosts, well organised service and comfortable accommodation. On-site parking too. Great staff, room and food. We could not feel more welcome! Great walking access to beaches and St. Ives. Also, a great suggestion for vegetarian dining. The hosts are very charming. The breakfast is delicious and with a lot of choices ! The bedroom and bathroom are confortable and very clean. Car parking is available at the B&B. Free WiFi. All has been simply perfect ! Note that you can walk to Saint Yves harbour along a coast path. It takes about 15 minutes to go there (nice walk), more for the return (steep path). The coast path is not usable at night (no lamps), but you can either walk along the road or take a bus or taxi. Saint Ives is a lovely place to stay and is a very convenient place to visit all the area (Land's End, Penzance, Saint Michael Mount, Saint Agnès, etc). Very friendly and helpful owners. Nothing too much trouble. We plan to return. Becks Fish and Chip restaurant is fantastic. Open topped Double decker busses along the coast roads are super. Tolgus Tin works provides a glimpse into the complex and harsh conditions of the mining industry and as part of the hugh Cornwall Gold site is all free of charge. You can even 'pan' for gold and keep all that you find. Lovely room. Excellent breakfast. Very friendly and helpful owners. The pub on the sea front in St Ives is excellent for supper. great hosts!! excellent breakfast!! very clean!! room was tastefully decorated and bed comfy:) location perfect as central point and access to all places to visit. st ives nearest location. some excellent pubs like the crown for meals anda great aptmoshere. but get bus or taxi back because road very steep. loads of places to visit. peter told us about alot of places to visit even if the weather was bad which it wasn't for most of our visit. lands end is excellent. the eden project. the beaches are breathtaking !! Very comfortable and enjoyable stay. Hosts were welcoming and breakfast was excellent. Cornish Arms was nice for a casual meal and conveniently close. The coast path walk was nearby and had lovely views to the ocean. We enjoyed our stay; our hosts were very friendly and welcoming. The room was excellent and had a lovely sea view. The breakfast menu was varied and very good. B & B = Best Breakfast! Ideal stay, easy to find arriving by car, helpful and friendly staff. Cosy and graceful room. What else? Stunning Carbis Bay in a short walking distance and amazing St Ives 20 minutes walk. Superstore 2 minutes, so Bus stop and Pub. Friendly welcoming hosts that nothing was to much trouble for them.excellent breakfast with extensive menu.The room was the essence of cleanliness with some useful additional little touches. We arrived strangers, but left feeling like friends. We would defffinitely go there again and will recommend to family and friends. We had a very restful happy break. Next time we would try to get a sea view. Carbis Bay is a must, it is a superb tropical looking beach and well worth using the coastal path beside the house to get there. 5 minutes walk down, but a bit of a pull back so allow a bit longer, however it’s well worth the effort. The Sloop Inn (The Captains Table) did very nice meals and the Cornish Arms is a stones throw away for a quiet drink. On a very nice day the open top bus will be a nice alternative to driving, as the view is spectacular over the hedge rows. It drops off at major attractions along the way. St Ives is a must too. Genuine friendly owners who couldn't be more helpful. Lovely breakfast served at a set time. Clean room maintained daily. Would recommend this place to make you feel welcome and at home. Regular repeat customers visit. A bit of a walk into town but there are taxi companies recommended or buses. I would return again. Visit the Tate St Ives and Barbara Hepworth Sculpture Garden. If you are artistic and interested in courses go to the St Ives School of painting for 3 day courses to inspire your artistic practice, all levels catered for. Would recommend the Sloop Inn for drinks with harbour view and the Captain's Restaurant above the Pub, Enjoy two steaks and a free bottle of wine. Porthmeor Beach is a must enjoy a Cocktail over watching the Sunset at the bar here, Enjoy! Very pleasant and welcoming - an at home feeling. Impeccable room, breakfast ... and warm welcome from Heidi & Pete. Highly recommended. 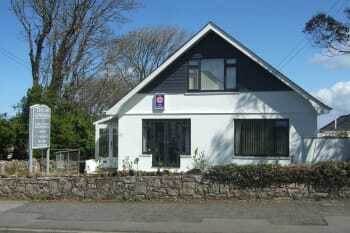 This is an excellent guest house well located for both St Ives and Carbis Bay. As a single traveller, I was impressed by the very warm welcome, spacious single room and first rate breakfasts.Thoroughly recommended. The sunsets from the wonderful Porthmeor Beach Cafe. Super freindly and helpful. Really nice. Do the Zennor walk from St Ives for sure. Very friendly staff, delicious breakfast, nice and clean room, great location! Your bnb was centrally located at St Ives. Heidi and Pete made us feel very welcome in their bnb and provided us with excellent advice as to where to visit in the area and other points of interest. It was always great to start our day with a laugh about something we were talking about. 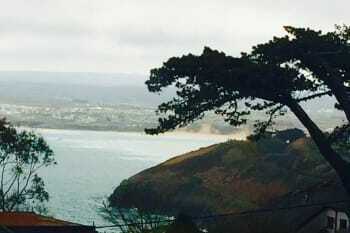 There is an excellent pub Cornish Arms across the road and a short walk away. It had an excellent menu and the food was top rate. The pub was very lively and the locals eat there too. St Ives is only a short ride way by car or bus to see the harbour and boats. We only stayed for one night but would certainly return. Lovely friendly owners, clean and delightful room with sea-view and delicious breakfast. The 15-minute walk along the coast path into St.Ives has wonderful views but there is also a regular bus service. So many things to see !!!! We were down for a wedding but really hope to return to this beautiful place! A wonderful place to stay. Heidi and Pete make you feel very welcome and could not be more helpful. I will definitely be staying here again. 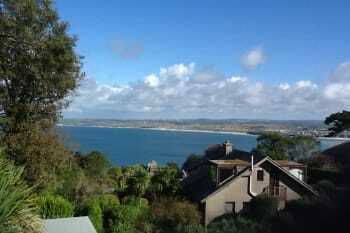 Situated within walking distance of St Ives a bus stop nearby and the coast path. A perfect place to stay when visiting this part of Cornwall. The loveliest of walks using St Michael's Way and the coastal path into St Ives and Carbis Bay. It's stunning. Very helpful hosts who will tend to your every need be it travel directions or food options. My third visit. Planning more visits in the future. There is a Tesco Supermarket with Café and a super pub all within 5 mins walking. All your needs catered for. After a very satisfying breakfast at the B & B, pick up a picnic lunch from Tesco, enjoy your day then have a delicious evening dinner in the pub. Plenty of local buses and taxis if you want to leave your car and go to St Ives for more pubs and restaurants. Or stroll down to St Ives by road or coastal path and taxi/bus back. Excellent stay in this wonderful bed and breakfast. Made to feel as though we were one of the family. Nothing was too much trouble. Location is very good. Views across the bay are amazing. The Cornish arms about 50 yards along the road is an excellent pub and the food is exceptional. Very nice welcome by Pete and Heidi. Room was clean and nice. We also enjoyed the breakfeast. Coast Path to St Ives was beautiful. Very nice B&B. Lovely owners, very friendly & welcoming. Good situation in between St ives and Carbis bay. Pete will give you advice and tips on most things as he knows the area well. We went to a couple of restaurants/pubs which he recommended and all were very good. We were very satisfied with the nice and very frendly couple Heidi and Pete. they help us for our trip around cornwall with good informations. And we thank ecpecially for the wonderfull breakfast every morning, what was not like this at ather hotels our accomodations. We woud like to come again and spand longer holydays at their lovely place. ask Heidi and Pete for all things you need their at St, Ives. Heidi und Pete sind humorvolle, freundliche und hilfsbereite Gastgeber.Das Frühstück war köstlich. Die Möglichkeit eigene Snacks und Getränke zu kühlen ist ebenso praktisch, wie die große Auswahl gekühlter Getränke zum Kauf für die Gäste. Alles war sehr sauber. Vielen Dank an Heidi und Pete! In St.Ives haben wir sehr gut im "Beer& Bird" gegessen. Eine sehr aufmerksame und freundliche Bedienung und eine gute Küche.Alles bei super Rockmusik. I would tell guests about the path that goes to the beach just behind the B&B, it is nice and easy to miss. Great hosts, welcoming and always helpful. Good local knowledge and advice re walks and places for lunch.Lovely breakfast and would recommend to others. Have visited St Ives many times but had never walked to the Steeple which affords splendid views of the bay and country side. Just ten to fifteen minutes from the house.Had the whole vista to myself in glorious sunshine. Very friendly hosts, great view, excellent breakfast with large choice. We ate two times at the Beach restaurant, the fish was fresh and tasty, and the view on the harbour is nice. A very warm welcome from Heidi and Pete. Top B+B with lovely,individual breakfast. Very useful recommodations for a walk and a good pub nearby from Pete. Thank you. Very friendly and welcoming place which fits the bill perfectly if travelling on business or pleasure. Clean and comfortable, modern and smart décor, very charming hosts for whom nothing was to much trouble, excellent breakfast. Pete & Heidi were the perfect hosts. They helped make my wife's birthday weekend unforgettable. Their local knowledge of what to see and where to go was invaluable. It was the perfect location for us, right on the coastal path & with a cracking little pub just a stone's throw away. We would recommend any other visitors to this part of Cornwall to stay at this B & B. The breakfast menu was fantastic & it was a shame we had to leave. Hi Mark and Kate, Thank you very much for your kind review. We are so pleased you both enjoyed your stay and Kate’s birthday weekend was a success! Very best wishes Pete and Heidi Ps hope,your team win the cup! Peter and Heidi did their outmost to make our stay great. Breakfast was fantastic. The room and bathroom were Nelly renovated. St. Ives is a great place to star your trip along the Coast. close to coast path for walkers. tesco nearby for provisions. fridge provided by hosts. bus nearby for st ives or hayle and beyond. very pleasant 20 minute stroll into st ives via the coast path. stunning views. st ives is beautiful. restaurants, shops & the Tate. our hosts were gracious & very friendly. The Tate is well worth a visit. stunning home for some splendid art. Such a lovely property to stay at, everything was perfect. Thankyou so much. Warm friendly welcome from Heidi and Pete, always available with information about what to do and where to visit. Excellent breakfast and comfortable room. There are so many places to see here, we tried to visit as much as we could, beaches are amazing and Kynance Cove and Lizard Point. Food and drink The Cornish Arms for us. Pete and Heidi were friendly, welcoming and really helpful during our stay. The bedroom had everything you need in a guest house and there was a lovely view of st ives bay and distant beaches from the window. The bed was really comfortable. 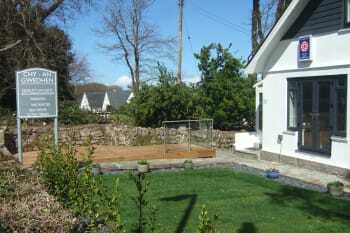 Excellent Base for a stay in St Ives or Carbis Bay. Go to Lands End its amazing. Hi Julie, Many thanks for your kind review and words. We really appreciate feedback and especially positive feedback! We look forward to welcoming you back to our B and B. Best wishes Pete and Heidi P.S Our wedding was magical. Everything went perfectly and a great time was had by all! Porthminster Beach Cafe is great. Lovely bed and breakfast. Menu choice for breakfast was superb. Pete and Heidi were extremely welcoming. Would definitely endeavour to stay again on a return to St Ives. Lovely friendly guesthouse. Our hosts were charming. The breakfast menu was very good with lots of choice. Just a wonderful place to stay. Couldn't wish for better hosts. Both Pete and Heidi were marvellous. If you get the chance, have a stroll down St. Michael's Way in to St. Ives. The famous footpath passes right next to the property. It's just beautiful. St ives is awesome great beaches Museum is huge loads to see Be careful of the seagulls they steal icecreams !!!! This was my second visit. Always welcoming and friendly. Nothing is too much trouble. Very nice hosts, lovely room, and great breakfast! A lovely place, very comfortable and beautifully presented. Really good breakfast with lots of choice. Very friendly and helpful people. Excellent location with immediate access to the coast path and bus stop. Comfortable bed, high quality furnishings, quiet room with a lovely view of Carbis Bay and a great cooked to order breakfast. Very obliging and welcoming hosts. Overall a wonderful stay. Heidi and Peter are very friendly and accommodating.The room was very clean and well set out but we found it a little small, ok for short breaks. We found a lovely coffee shop called The Pier coffee bar. The coffee was delicious! Tregenna Castle is worth a look the views are stunning from the grounds. Pete and Heidi have a great knowledge of the area, they recommended a great pub for a dance and music; The Sloop. Very friendly and helpful hosts, excellent breakfast and rooms were spotless. Couldn't have asked for more. Lots of good restaurants in St Ives. Day trip to Land's End worth doing. St Michaels Mount also worth a visit. Very friendly and welcoming atmosphere. Excellent breakfast with lots of choice. Cornish Arms across the road serves good food. Easy to walk to St Ives or Carbis Bay via coastal path. Pete & Heidi are always most friendly,welcoming & helpful with a good sense of humour. Fabulous 2 night stay with Pete and Heidi. Best B&B we've ever stayed at and great location with frequent buses passing to go into St Ives - far less hassle than trying to park there. Would definitely recommend Chy an Gwedhen! This B&B is run by a lovely couple who make you feel welcome and are always willing to give you advice (where to go/ what to see etc) or answer any questions. The rooms are nicely decorated, the location is great (very close to the seaside) and there is a variety to choose from at breakfast. The best B&B we've stayed in! Beach Restaurant has great fish! Definitely go to Minack Theatre! Go to the lighthouse on the harbour (close to the Lifeboat Station)- you may see some seals! Perfect stay: Pete & Heidi were extremely friendly and made me feel very welcome; superb location, next to coastal path. Would definitely (try to) book again, if return to St Ives in future. Feet people and super location 10 mins.for everywhere it seems. Very happy thank you. Heidi and Pete great hosts, will stay again if visiting the area, great sea veiw room, great location for summer walks. Coastal footpath great, lots to do, fell in love with St Ives. Everything you would want from a B n B. A comfortable bed and a lush breakfast. Already booked to return next May. Lovely hosts beautiful location great views from a few bedrooms which we will have next time.its the cleanist BB we have been to by far. Hi, Thank you for your review. Pete and Heidi. Friendly and obliging. We have enjoyed our stay very much. Thumbs up. Thank you. Great Location. Short walk to St. Ives. Restaurants locally. St. Ives is an amazing place to stay because it is an absolute beautiful little town, a good place for watching the sunset and there are many things to do and a great choice of Pubs, Restaurants and Bars. We also can recommend the Pub 'Cornish Arms' which is close to Chy an Gwedhen and has very good food. Thank your for your very warm welcome, we enjoyed our stay at yours very much. Keep your humourous way. :-) All was fine, room, breakfast etc. Made to feel very welcome.Very friendly. Excellent breakfasts. Nothing too much trouble. Seafood restaurant - very good - need to book. Catch a train to Carbis Bay - beautiful beach. Lovely accommodation run by friendly , welcoming and helpful people. Pete & Heidi have done an excellent job creating a great base for anyone to explore Cornwall. They have a great ability to make strangers feel like friends. Always making themselves available to help. The place was spotless, modern, very comfortable and a joy to stay. If your looking for a place stay in St Ives then why would you choose anywhere else. Hi Terry, Thank you for your very kind review. We are so pleased we helped you enjoy your holiday. We did have some laughs! Hope your journey home wasn't too bad. Would be great to see you again one day (room 3?). Very best wishes Pete and Heidi Ps. Keep collecting those tea pots! Wonderful hosts. Heide and Pete were very welcoming and able to answer all questions. Great English breakfast with lots of choices. Very clean and comfortable rooms. Very comfortable bed . Taxi service very reasonable to get around the town. St Ives is a lovely seaside town. 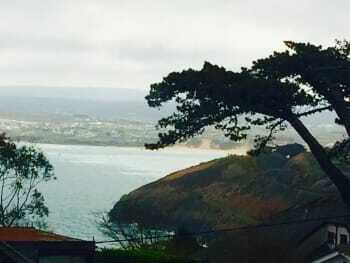 I went to Carbis bay hotel and Soa for a lovely Wedding and the service they was really good. The map included on the booking website was a bit lacking in detail. No street number or landmarks were included (close proximity to Sainburys would have been beneficial). Make sure you bring good hiking shoes, the many walks available are not to be missed but take some effort. Very friendly and welcoming. 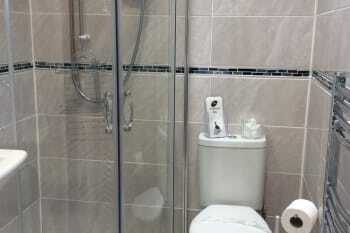 Well appointed room with good en-suit shower. Every effort made to make it a pleasant stay. If all B&B's were of the same quality as this one there would be less holiday makers leaving for foreign holidays. Everything about the place makes you feel comfortable and relaxed. The greeting, attention to detail and the food were everything you could hope for after a long journey/day at work. A lot of thought and application have gone into making it a pleasant experience. A thoroughly enjoyable stay. Friendly and helpful hosts - nothing was too much trouble to them. Would be very happy to stay there again if visiting that part of Cornwall. Excellent breakfasts. We were very happy with the food at the local pub "The Cornish Arms"within a very short walking distance. Also "Becks" fish restaurant about 3/4 mile away is very good. Although they take a while to drive to, the "Eden Project" and the "Lost Gardens of Heligan" are well worth a visit. Also, St Ives is very pleasant and just a short bus ride away and St Michael's Mount a short drive. Exemplary service, room and stay. Warm, friendly and helpful hosts running a much above average reasonably priced service. Well placed for walkers in terms of easy access to paths. Frequent bus services a few minutes walk away and between two rail stations. What a lovely place to stay. Fabulous walk in to St Ives and easy bus access back. A pub a couple of doors down is handy. Heidi and Pete were fabulous hosts and the breakfast was special. So good we booked an extra night. We received a very warm welcome to the bed and breakfast by two really nice people. The room was clean, well equipped and very comfortable. A really nice stay to a good weekend. Breakfast was excellent too! The bean Inn was a great place to eat. the view from the room was stunning, we stayed in the sea view room, Pete and Heidi were very welcoming and helpful, the room was spotless and the facilities were great, the fruit salad for breakfast was lovely. can't wait to go back! the Black Rock restaurant in St Ives was incredible and the prices were very good - Perfect date night meal! Lovely warm friendly welcome. Nothing was too much trouble. Like visiting family! Breakfast was delicious & caters for everyone. You certainly won't go hungry! Room spotlessly clean & inviting, bed very comfortable, beautiful sea view. Enjoyed our visit so much, we've already booked our return trip. Thank you Heidi & Ellie for such a memorable stay. Lovely little pub within walking distance 'The Cornish Arms' for a very tasty meal & good selection of beers. Heidi & Pete were very friendly and helpful. Our stay was always a pleasure. Fantastic breakfast.Everything was made fresh. It's a short walk away from St.Ives with many fantastic views to the coast,beach and harbour of St.Ives. Carpark in the back of the house. Fantastic service. Extremely friendly and huge breakfasts. Can't recommend enough. Truly lovely stay, spotlessly clean, great facilities and wonderful hosts. Loved the location of the footpath to St Ives. Oh and super scrambled eggs with the delicious breakfast. Promote the footpath to St Ives. Heidi & Pete were very welcoming. There were so many special touches to make the stay more comfortable. Breakfast was delicious and I was so impressed that not only was tea and coffee available in the room but also camolmile and peppermint tea The room was comfortable and very quite with a lovely sea view. Thank you both. We ate at the Badger Inn in Lelant each evening. So good that we didn't want to try anywhere else. The only drawback was that my shower was tepid on the first 2 days when other guests were also using the water. Otherwise it was all lovely thank you. Lovely walk along the coat path to St Ives. Accessible to all West Cornwall attractions. Easy to find. Very welcoming and hospitable hosts, comfortable room with double shower, generous breakfast. All in all, a great and peaceful place to stay away yet within easy reach of the hustle and bustle of St Ives. Right by the house there's a 20'-25' walk down through the trees and along the coast into St Ives, or a £2 bus-ride with stops close by. There's a pub and a vegetarian restaurant a few minutes' walk away, as well as a wide range of eateries down in St Ives. Everything about Chy an Gwedhen was superb. The room was comfortable, spotless and had a magical sea view. Our hosts were very friendly and made us feel at home from the minute we walked through the door....and the breakfast was perfect. Delighted! We had a lovely meal in The Cornish Arms - literally across the road from the accommodation. Well worth considering. Also, there is a great 20 minute walk into St Ives along the coastal path which literally starts at the front gate of Chy an Gwedhen. Highly recommended. Pete and Heidi were very welcoming and friendly hosts. One of the most comfortable beds I have slept in and a plentiful breakfast. The only improvement needed are the towels, mine was quite thin and rough. Great place to stay, thanks! A very comfortable stay and welcoming hosts. I would definitely stay again. Good value for money. Nice pub within walking distance. The coastal path is right on the doorstep so you easily walk to Carbis Bay and St Ives. we were very impressed with our stay. very helpful, kind and well looked after. rooms were clean and well maintained.lovely breakfast and good range of selection! we would stay here again. we were at a wedding so location was perfect! Heidi and Pete are superb hosts. Really comfortable bed, excellent room, great breakfast, best B & B we've stayed at, top marks for thinking of everything ! Lovely welcoming stay for 2 nights in Carbis Bay. Great location for 15-20 minute walk along picturesque coast path to St. Ives with great full English breakfast to start our day. Very reasonably priced but still a great stay and lovely location with views from our bedroom window over the bay. Very close to lovely coastal walk to St,Ives but it is steep so bring shoes can walk in. Very friendly personable service. Excellent breakfasts,especially the smoked haddock. Very conveniently situated with Tescos within a few hundred yards,plus an excellent pub only 100 yards away.Access to the coastal path to St Ives couldn't have been easier & involved a 30 minute walk into the town. friendly owners, view of the beaches from our room , comfortable beds and a clean on suite. overall very good stay. The badger inn at lelant does a good carvery. st ives has many restaurants but you need to book at the weekend. Little gem of a find! The room was spotlessly clean and tastefully furnished. Excellent location, a coastal path right next to the b&b takes you down to st ives. Pete and heidi the hosts were extremely welcoming and helpful. Breakfast was tasty and well cooked. Will be highly recommending to friends and would definitely return for a stay. The vegetarian restaurant "Bean Inn" on main road very good. Cornish Arms good for pub type food. Coast path walk good. We both enjoyed our stay with you. We found you both very welcoming, friendly and helpful, with a lovely sense of humour and a smile. The Cornish Arms down the road is a great little pub where you only have to walk a couple of minutes to get a good meal and drink. The Minach Theatre, Porthcurno, Mousehole, St. Michael's Mount, Land's End, Porthgwarra and of course St Ives itself with its beautiful beaches and shops and galleries. Hi Jeffrey, Thank you for your kind review. Best wishes Pete and Heidi. This is a really nice B&B. Location is great, and access to St Ives is easy by bus, taxi or on foot. The B&B is also on the SW Coast Path. We enjoyed everything about our stay at CaG. The friendly and helpful owners/staff were always on hand, but were not intrusive. If we do require future accommodation in this area, we will enquire first at Chy an Gwedhen. The nearby Tesco supermarket does not sell petrol. The hosts were very friendly and welcoming and provided a very personal service. I only stayed for a couple of nights on business but would definitely wish to go back to St Ives for a longer trip for leisure and wouldn't hesitate in booking this guesthouse if I did and highly recommend it to anyone else. Heidi and Pete are lovely! Helpful,friendly and great sense of humour. Breakfasts are fabulous and the traditional full English monumental! A very relaxing place to stay. Would definitely go back. Lots to do. Transport services especially buses excellent. Take the little coastal train but forget about going to St Erth at the end of the line... Lots of places to eat and pasties galore. Don't miss out on a fish n chip meal in the Balancing Eel - delicious. Excellent place to stay,lovely hosts, very welcoming and helpful, breakfast was delicious, very good choice and room was clean and comfortable. Couldn't ask for more, would definitely stay again and no problem recommending to potential visitors. The bed and breakfast is within walking distance of St Ives (about 15-20 minutes) or alternatively a short bus ride, bus stop situated nearby. Nice pub nearby too which serves meals and a good choice of drinks. Heidi and Pete a lovely couple very friendly nothing was to much trouble we will book again. Very friendly and made us feel at home. Restaurants in St.Ives are good,but get in early or make a reservation. Porthminster cafe is living on its reputation - I found it very expensive and portions small and nothing special. Pub over the road is really good. Very welcoming and accoomadating. Made me feel very welcome. My only moan is the guests in the room above me where not very considerate of thier surroundings. Talking and banging about until the early hours. I would use and recommend in the future. Thank you. St Ives is wonderful. Always something to do and see. Carbis Bay is beautiful well worth a visit....more than once! A nice friendly family run hotel handy for St Ives near to Coast Path and local transport. We had a very enjoyable stay. Heide & Pete were great hosts,very friendly and made us feel very at home. very friendly welcome, most helpful with a wish to please and create a very pleasant relaxed atmosphere. Oooooh its lovely !!! !, friendly welcome from Peter who runs/own the place. Nice view of beach from our bedroom ,I find it Difficult to sleep anywhere other than my own bed first night cause im fussy like that ,but the bed was so comfy i slept like a log! breakfast yummy ,wish we could of stayed longer very happy with our stay will be booking again for another stay on next visit to cornwall. Great place to stay. Good food, comfortable. Friendly host and hostess. La Caseta on Trencome lane, Spanish theme. Great food and service. Very pleased with my choice of accommodation. Location was perfect - straight out of garden onto coast path and just half an hour walk into St.Ives. Being able to leave the car and walk in was great. Super friendly people - and I appreciated being able to check in early. Everywhere was spotlessly clean with nice touches such as an honesty bar and guest fridge. Breakfast was ordered the night before- plenty of choice. When visiting St.Ives again will definitely check availability at Chy an Gwedhen. Thank you! Recieved a very warm welcome on arrival. Pete and Heidi are very friendly and caring hosts. Nothing is too much trouble for them. It really felt like our home from home. Have already booked to stay again. An ideal base for people walking the SWCP as this is only a few yards away from the path. Tesco is very close by and handy for stocking up on sandwiches etc for walking. However, the breakfast at Chy an gwedhen will set you up for a good few hours. Excellent bus service and rail links close by. Numerous excellent restaurants in St Ives. Found Heidi and Pete very friendly and welcoming. Spotlessly clean and comfortable. Five star value at three star prices. Look forward to future visits. A must see is St. Michaels Mount, Marazion. Mousehole, Porthleven and Hell's Mouth, to mention just a few, are well worth a visit. The Mermaid Restaurant, Fish street for seafood. Made most welcome by Heidi and Peter, who made every effort to make my short stay enjoyable.Thank you for providing lovely early breakfast as specially requested. hope to see you again. 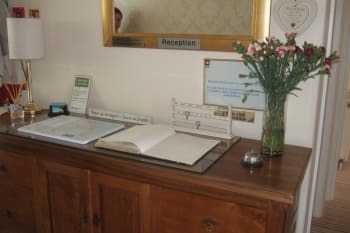 We received a very warm welcome and although our stay was for one night only it was extremely comfortable and everything was provided, even iron & ironing board. A good selection is offered for breakfast all provided to a high quality. Brilliant couple who make you feel welcome as soon as you eventually ( private joke ) walk through the door and continued in the same vein throughout our stay. 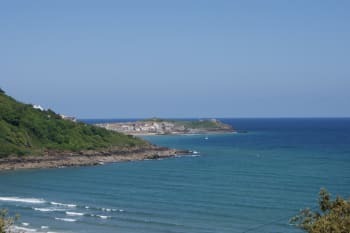 St Ives has a multitude of excellent restaurants but the use of a taxi is recommended for anyone with any medical problem as the hills are quite steep and the parking in the town is not very good especially in high season. A very friendly family run B&B; whenever we met we had a cheery chat. St Ives and Carbis Bay, the list is endless! Very clean and comfortable accommodation with great hosts who were all you could wish for. Would recommend highly. Heidi and Pete, you are absolutely gorgeous! I really did feel at home! Plenty of various types of eating places in St. Ives.Excellent base for days out. Nice room, great view, friendly hosts and a tasty breakfast. What else to you want? Our welcome was warm and friendly. You put us at ease straight away. The whole house was spotlessly clean and well cared for too. Breakfast was good, plenty of choice and nicely cooked. The Haddock was cooked perfectly! One thing that might have made the breakfast room more relaxing would be to have some background music on low to fill in the quiet moments! ! This is our second time we have stayed with you. The room was lovely as was the service that we received. We fully enjoyed our stay and will be returning in the future. we took a work on the costal area of the lizard point which is beautiful but not over crowded. Also we went to the Minack Theatre which was lovely, remember to bring a blanket and cushions though. Sorry to say breakfast could have been hoter . Evreything else we could not fault . Ideal place to stay and walking distance to restaurants along the coast. On a bus route . All ideal. A thoroughly pleasant stay. Spotlessly clean, comfortable beds and excellent facilities. Lovely breakfast. Would definitely stay here again. Thankyou, we are so pleased you enjoyed your stay, and hope to see you again. Everything was good,the only thing that was a disappointment was that I booked a double and we were given twin beds. I feel we should have been told beforehand, so that we could have made an alternative booking. Porthminster café.Badger inn ,Hobblers and The Mermaid, good food and service at all. Places to visit Lands end Geever mine and Seal sanctuary also shipwreck museum . Thankyou for your review, we are so pleased you enjoyed your stay with us, and hope to see you in the future. Absolutely spotless, vey comfortable accommodation. The room we stayed in had a wonderful sea view. I have already recommended this hotel to my brother who stayed there a couple of nights after us and he too was very impressed. excellent hosts good range of menus for breakfast. can recommend the full english. everywhere very clean and pleasant all in all a good place to stay. would recommend the sloop for food and a good night out. st ives itself is a very good place to wander round and enjoy,its also within easy reach of places like lands end and penzance. Thankyou so much, we are so pleased you enjoyed your stay. we look forward to seeing you again. Everything was o.k. When I travel back to england (and I will) I know where to stay in St. Ives. I can really recommend this bed and breakfast to other travellers and I will recommend it to my friends. It was lovely to meet you, we are so pleased you enjoyed your stay with us, we look forward to seeing you again.